WHAT THE F***. STORM IS A DARKSKIN AFRICAN! First Halle Berry then Alexandra Shipp. Y'all just won't let Storm be the brownskinned woman that she was, huh, Hollywood? They CONTINUE to miss the mark in casting Storm! She is a DARK, VOLUPTUOUS woman. Well, we're going to wade into the debate and explain why Alexandra Shipp is the perfect choice for Storm. 1. Shipp's Not a Bad Actress - Some people are criticizing her acting, which I think is at least an argument we can have. Many point to her role in Aaliyah as a sign of her poor acting skills. Well, first, I would say that role was more about doing an impression of Aaliyah than acting. Second, that movie was doomed to begin with. She did the best she could with the material she had to work with. Third, we don't know what kind of direction she was given. As we mentioned earlier, people thought Natalie Portman was a bad actress based on her performance in The Phantom Menace. I thought Heath Ledger was a terrible actor based on A Knight's Tale, but he proved himself in The Dark Knight. Shipp has managed to have a thriving career for years in a very tough industry, which means she can't be as horrible as people are claiming. Let's see what Shipp does with the material. Also, let's face it. The X-Men movies are known for their special effects and action sequences, not acting. Halle Berry wasn't exactly winning Oscars for her scenes as Storm. 2. At Least We Have Storm - We should be celebrating that they continued to support a strong minority role. They could easily have taken the chance to cut Storm out of the movie series or recast her as a white actress. And don't say it couldn't happen. This is Hollywood we're talking about. They switch races all the time. 3. She's the Younger Halle Berry - There's a reason they put Jennifer Lawrence in the same blue makeup as Rebecca Romjin. The reality is that this was not supposed to be a complete reinvention of the character. This is supposed to be the younger version of Halle Berry's Storm. If they had cast someone the color of Lupita Nyong'o in the eighties, we'd be joking about how Storm got ten shades lighter in the nineties. Berry is mixed race, and Shipp is mixed race. Continuity, people. 4. Storm is American, Not Kenyan - Some people argued that Storm has to be darker skinned because she's from Kenya. Well, that's not quite correct. While it's true that Storm (aka Ororo Munroe) ended worshipped as a goddess in Kenya, that's not how she started. According to the comics, Ororo was actually born in America, the daughter of an African princess and an American photojournalist. 5. There Are All Shades in "Africa" - It's also a myth that everyone in Africa has extremely dark skin. First of all, Africa is a large continent. I mean, Egypt is part of Africa. Technically, France is part of Africa. When people say Storm is supposed to be "African," they really mean "South African." And as far as South Africa, there are people of many shades. Yes, there are even mixed-race people in South Africa. Saying Storm is "from Africa" doesn't automatically mean she has to look extremely dark. 6. Let's Stop the Color-Hating - Here's the main crux of our argument, though. We as African Americans need to move beyond color prejudice in our own community. The days of criticizing someone for not being "black enough" should be long gone. How can we expect people outside the African American community to move beyond prejudice against dark skin if we ourselves are looking down on light skin? A woman of African American heritage has a major movie role. Let's celebrate that fact, and get together behind it. What do you think about Alexandra Shipp as Storm? Are there people protesting her? Why? Weird. When it comes to the Internet you can't make anyone happy. True. "Welcome to the Internet: No one is happy here." I hadn't heard about this casting, but it makes sense to me. As long as she portrays the character and stays true to that, the color of skin shouldn't make a difference. Funny, because Johnny Storm from Fantastic 4 is white in the comics and he's now black in the new version, so why can't it happen the other way around? Storm is from Africa doesn't automatically mean she has to look dark........... What do you mean by this??? Seriously!! It's a silly thing to be upset about, especially considering it was established in the comics that Storm doesn't look traditionally "African" or "Black". The features that she gained from her bloodline, that gives her the unique white hair, cat eyes and the cheek bones, predate conventional racial archetypes. She's been illustrated in many different shades throughout her 40 year run. And you would be correct. 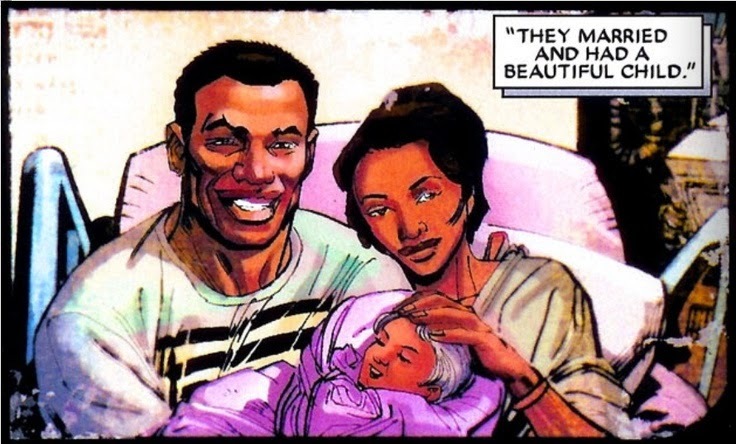 Storm is African American, not "African", since she was born in New York and her father was African American. Another interesting thing to note here is the fact that the character itself has faced this "whitewashing" criticism back in the day(80s) when she was in her prime. Many people criticized Chris Claremont for glorying a character that didn't appear to be "fully black" in their eyes. And ultimately face resistance within the black community. It's ironic that now we have people today saying an actress portraying said character isn't "black enough" to portray the character, when at some point the character itself wasn't considered "black enough". This is mad bs storm is African half of the people here don't even read her comics. The original storm is African, Xavier found her in Africa and Her original character is dark skin and what I don't understand is that with Caucasian characters they portray it to a tee. So why can't they do it for african Americans why is it so hard to portray a darkskin female. Its just the first step when casting they aren't giving people of darker shades opportunities to establish themselves in the acting world. It's all a bunch of bs science fiction is to portray people of all skin types not light skin to white. If you don't see the problem than you are just Euro washed just like the rest of the ducking world. This is more than 'why it can't happen the other way around'. This is about erasure, lack of exposure. Through-out media, people of color, especially 'darker-skinned' black and brown people have been denied representation and exposure. You don't see much of them, or any person of color in media because they are all white. We know that the world, especially the United States is not just white people (as they are soon to be the 'majority minority' below half of population). The entire industry and entertainment is white, so when you remove just one white person, it doesn't have an effect. That effect is nothing because you still have a heavily white majority and they all look the same. When you give an opportunity for a character to be played out, you do it well, especially in this case of accuracy. There is a denial, and continuing denial of the darker skinned person, and of the black female body. You're spinning that every which way honey. She's practically an albino! Because there are multiple portrayals of whites in media, while there's one or two every so often of us. Especially positive portrayals of us dark skinned black women. Storm isn't light skinned in the comics.